Bruno’s Outdoor Electra-Ride Elite Provides Exterior Access. The Outdoor Electra-Ride Elite is the leader among chair lifts for outside applications. An outdoor stair lift with many standard features, it’s remarkable. Don’t compromise your independence, inside or outside your home. Built in Wisconsin and tested in all types of weather, the Outdoor Elite is reliable, safe, durable and designed to withstand the elements. An outdoor stair lift of this quality allows you to navigate the stairs outside your home with confidence and ease – any time of year! With the same quality, comfort and dependability found in any Bruno home stair lift, the Electra-Ride Elite Outdoor stair lift provides more. 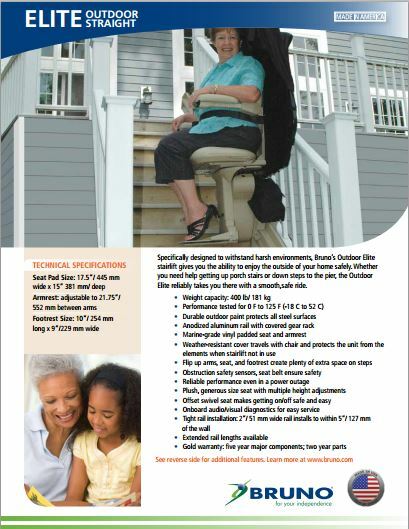 With innumerable uses – from your front door to the sidewalk or your cabin door to the boathouse – this outdoor stair lift offers unique mobility. Only a home stair lift designed like this one can extend your independence safely and securely outside your home. Not all chair lifts are created equally –Bruno built = Best built. We are proud to offer financing on stairlifts, porchlifts and other select items. Please fill out the form below to get started.